New Zealand is packed full of amazing scenery, delicious food and drink and unique outdoor activities. Over 1/3 of the country is made up of protected parkland and marine reserves, and no matter where you are in the country, you are never more than 128km (80 miles) from the sea! Whether you are looking for peaceful tranquillity, big city experiences or that next big adventure, New Zealand has something for everybody. 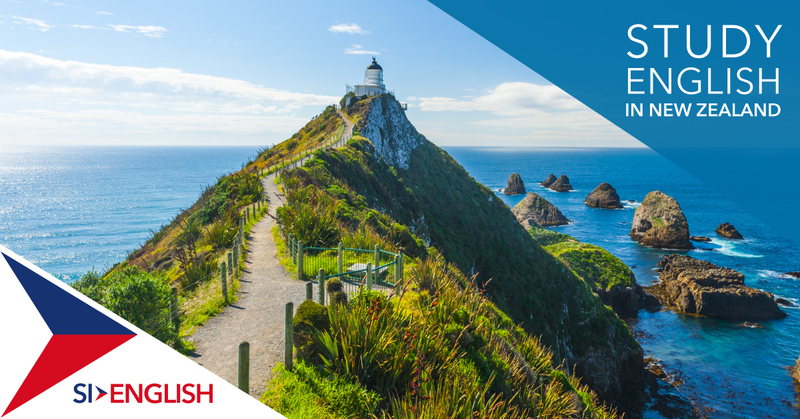 Learn more about why you should study at a language school in New Zealand below and apply with the SI-English 100% Free Service today. The weather in New Zealand is one of its main selling points. Summers are hot, winters are mild, and you will rarely be cold. The sunny climate also has an effect on those who live in the country, with New Zealand residents some of the friendliest and most welcoming in the world. In addition, New Zealand is also one one of the safest countries in the world to live. Māori are the indigenous people of New Zealand, also known as tangata whenua. The Māori make up more than 14% of New Zealand’s population and came to the country more than 100 years ago. While studying in New Zealand you will be able to experience Māori traditions and go on tours unique to this specific part of the world, broadening your cultural horizons. If you enjoy staying active and taking part in a wide variety of activities on land, sea and in the sky, you’ll fit right in. Choose from canyoning, climbing, parasailing, fishing and windsurfing in the summer, to skiing, heliskiing and snowboarding in the winter months. Your outdoor itch will be scratched! Also known as Taumata Hill, Taumata whakatangi hangakoauau o tamatea turi pukakapiki maunga horo nuku pokai whenua kitanatahu is the longest place name found in any English-speaking country! It roughly translates to "the place where Tamatea, the man with the big knees, who slid, climbed and swallowed mountains, known as 'landeater’, played his flute to his loved one." Take a photo and send it to family back home! If you are interested in studying English in New Zealand, apply with SI-English today. We can help you apply and guarantee you an offer letter from a school within 24 hours using our 100% Free Service!